After month of speculation, leaks, leaks and more leaks we have our most "semi-official" look at the yet to be announced Nexus 5. This time it's courtesy of Google's own Google Play store! 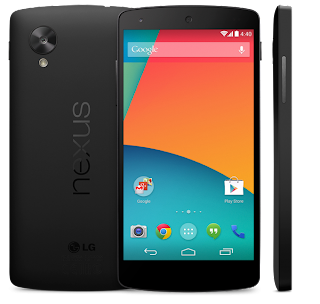 A listing for the Nexus 5 went up momentarily with images and storage sizes. It looks like the baseline model will start at 16GB of storage and will be priced at $349 (USD). This then implies that the 32GB version will come in at a paltry $399 and will probably come with a slight $10-20 overcharge for us Canadians. Rumored specs include; 5-inch Full HD display at 442 ppi, a 2.3GHz Qualcomm Snadragon 800, 2GB of RAM, 16GB of internal storage (with the possibility of other capacities), 8MP, 2300mAh battery + wireless charging as well as LTE and NFC. We eagerly awake for Google to officially unveil this beast.